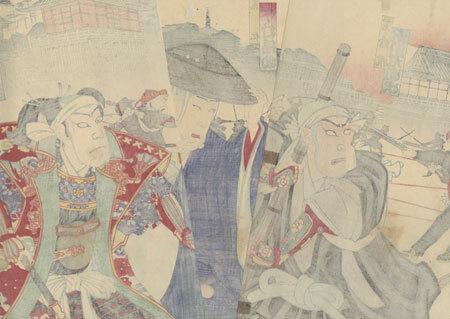 Comments - Interesting kabuki scene depicting the Battle of Ueno during Boshin or Toh Dai War of 1868 - 1869 between samurai loyal to the shogunate and Meiji Imperial troops. 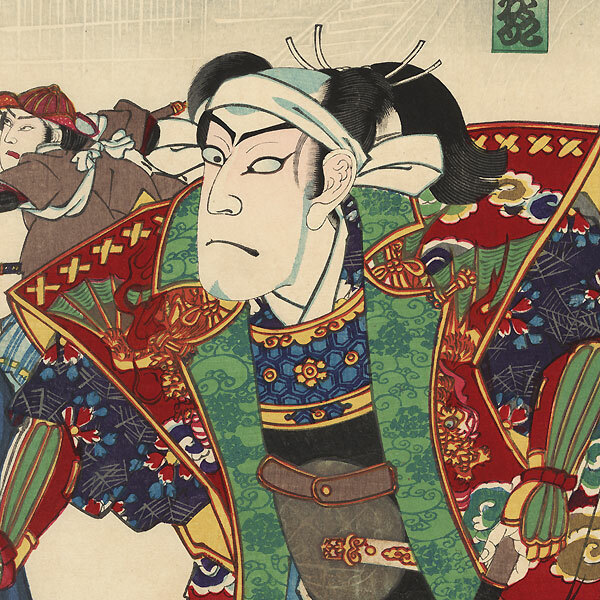 At right, a samurai wearing a dragon vest over his armor throws his hand out in alarm, a tight-lipped frown on his face. 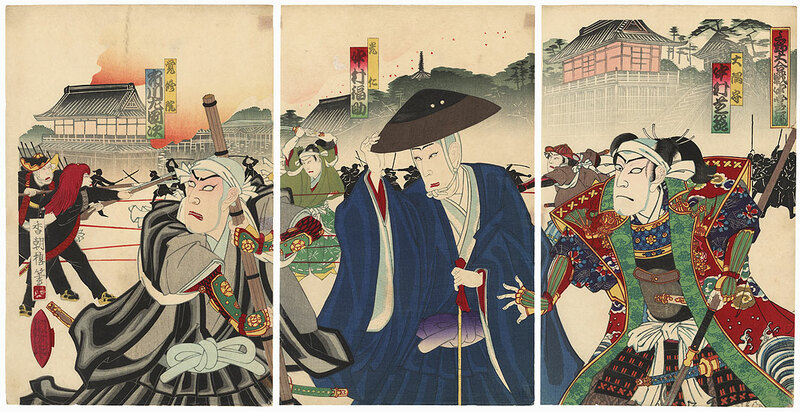 In the center, a monk lifts his hat with a slight smile, seeming unconcerned with the fighting going on behind him and the shots streaking across the sky. At left, a warrior monk grimaces as he looks up, gripping a club with both hands. The man at far left wears the distinctive shaguma or "Red Bear" wig that identifies him as a soldier from the Tosa Clan fighting for the emperor. Temple buildings can be seen in silhouette along the horizon, with red orange flames rising from the structure at upper left. A striking design, detailed with burnishing on the black uniforms at left, the monk's hat, and the armor at right. Condition - This print with excellent color and detail as shown. Three separate panels. Small stains at sides from previous attachment with adhesive tape. Slight soiling, a few marks. Please see photos for details.